Keeping you up to date on everything that's happening with Children's Ministry. The month of Love – February is one of my most favorites! I hope each of you feel the love and support Pinnacle Presbyterian offers. Young people are valued and honored and we want to get to know you. We hope to see each of you very soon! Our focus this month will be the gift of service. We learn from Jesus the act of service comes in many varieties. We will review washing of the feet, feeding 5,000 and much more. We welcome Dr. Ilona Adler as the Associate Director of Ministries in Music and Arts/Organist. Dr. Adler will, among many other tasks, direct our Children’s Chime & Bell Choirs. Please introduce yourself and make her feel welcome at Pinnacle! We also welcome Helena McGinn and Shirley Riolo to our Church School leadership team. Ms. Helena will be with the preschool students and Ms. Shirley with the Kinder - 2nd grade each week. We love having the consistent teachers and still welcome our parent volunteers to serve as they are able. Family Focus Sunday begins February 10th! Students are able to serve in worship the 2nd Sunday of each month as a greeter, acolyte, giving the Call to Worship, or reading. Please consider serving (monthly if they’d like), click here to sign up. Musical offerings will be enjoyed the 2nd Sunday of each month and students will stay in worship. This is a great time to invite friends/family to worship with you! Let Ms. Hillary know of your Valentine’s Day plans and she’ll have a special prize for you! Church School is offered every Sunday during the 10 am worship hour. Join us for a Bible story, activities and FUN! Bring your church banks back for Commitment Sunday! Tickets go on sale March 1st! Lunch, Plan and Set-up for the week! ﻿Interested in what your child will be learning in church school and during Wednesday night Bible Study this month? Click here for the February lesson plan outline. I don’t think there’s a person alive who doesn’t like french fries. When they’re hot and fresh and crisp and golden like these, they’re pretty hard for anyone to resist. How many of you get french fries any time you go out to eat? Now let me ask you this: Have any of you ever had to pay the french fry tax? The french fry tax is not a government tax. It’s a Mom and Dad tax. Interested in suggestions on how to spend time together as a family? Click here for fun activities to do together as a family this month. 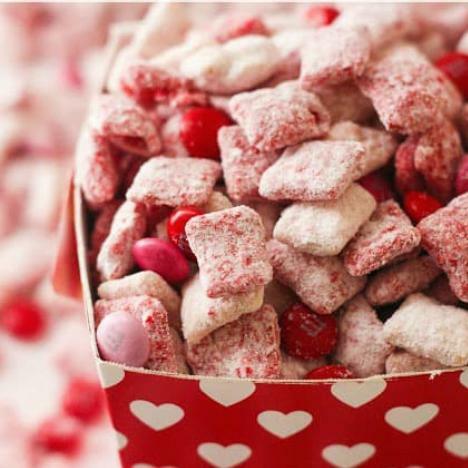 Try out this delicious and addicting Valentine's Day treat with your kiddos this month! A fun twist on the traditional chex mix. Click here for the recipe. As we close the chapter of our study on Self Control, let us be reminded that you Lord, are in full control. We enjoy the grace & love you provide and we value the community you have created for us to enjoy at Pinnacle Presbyterian Church. Help us to open our hearts to learn how to serve to honor You! Pinnacle Presbyterian Church Loves You!